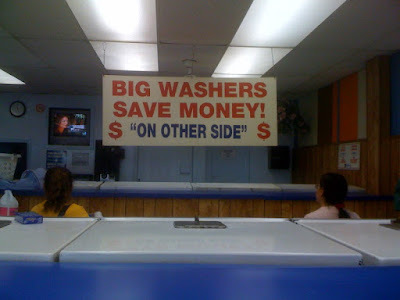 The “Blog” of “Unnecessary” Quotation Marks: like the afterlife? I don't think you're supposed to be able to store up treasures in heaven, unless they mean by being nicer to the earth... thanks, Caity. OMG, you mean you need $ in heaven? i am so screwed!! wait a minute, you mean i still gotta do laundry in the afterlife? i aint going! The Bible does say to store up yourself treasures in heaven where moth and rust do not destroy. personally, i like the idea that there are bigger, cheaper washers in heaven. I believe they are NOT talking Heaven! @Greg, you may be right, but i bet things would dry better then. OMG Jennifer, 'quotemarks' with a concrete core and synthetic rubber exterior.